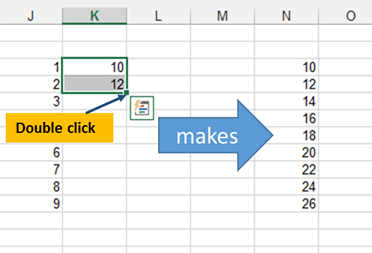 Here the BASICS on how to copy, paste select in Excel. To select one word: Usually it is enough to double (2) click on the word. To select one phrase or a paragraph: you have to triple (3) click fast. If you want to select only a part of a paragraph then the best is to click the beginning postion, and while maintaining you button pressed, move your mouse to the end. You can also select with the keyboard by clicking on the beginning of the text you want to select and then by holding the SHIFT key down and using the arrows to select what you want. This is the most ACCURATE. Copying can be done EVERYWHERE, I mean not only in Excel or Powerpoint or Word but also in Internet Explorer or Chrome or any other program you will have to select, copy and paste text or images. 1) click on the copy icon. 2) Right Click on the selected area which will open a so called contextual menu and select the copy function. 3) Press CTRL-C on you keyboard. This is the FASTEST way. ONCE it is copied, the text is store in a clipboard. You can retrieve it by Pasting it. You will see there are a lot of different ways to PASTE something. Dépending on what you want to keep of what you copied. For exemple you have copied a cell which contains RED text. You might want to paste only the text but not the red colour. This is possible by selecting the correct PASTE function. In that case, the icone PASTE VALUE. 3) Press CTRL-V on you keyboard. This is the FASTEST way and will paste exactly what you copied. TIP: you can EMBED a document or a Table in WORD or POWERPOINT. This will allow you to change the values directly in Word or Powerpoint. Type CTRL V and select the number only selection or select one of the following options. Then the cell will be replaced by the value. YOu can do this on multiple cells at the time too. 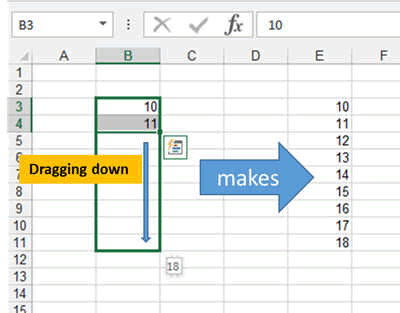 A great fonction in Excel is the dragging function. You Drag a cell or multiple cells when you click on the lower right corner of the cells and then, keeping click down, drag this points down. 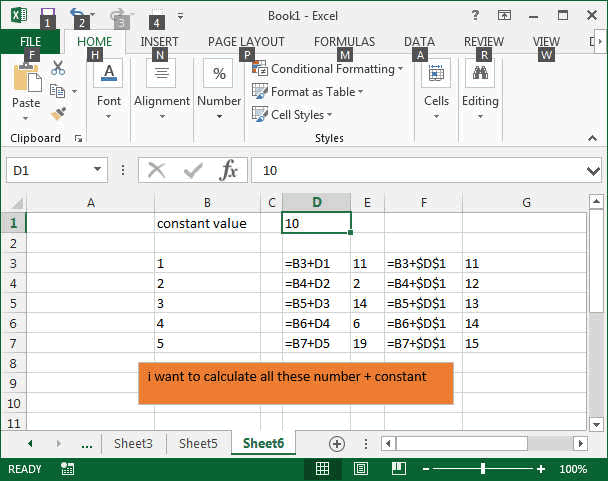 You can also double click on this point to automatically copy the cells towards the bottom (only if there is already a column filled out with values next to it). Here the example of the double click. 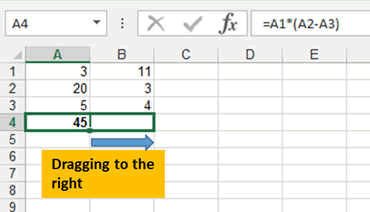 When you copy or drag a formula, Excel automatically adjusts the cell references for each new cell the formula is copied to. 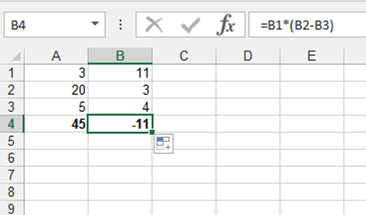 Look at the formulas in the D column here under where the B cells have been adjusted to the row they are in. If you use the $ sign in a formula, the coordinates in front of which is the $ sign will not change when dgragged or copied. This is especially important when you have constants or unique values in your table.